Colbert’s crowd responded enthusiastically, which is sort of the point, one supposes, although Sanders’ repeated calls for the Democratic Party and progressives to come together partook of the same crowd-pleasing messaging without addressing how best to reconcile the still-open warfare going on between some Sanders and Clinton supporters. (Sanders’ dig that Clinton couldn’t manage to beat “the most unpopular candidate in the history of this country” was certainly a departure from the high road he otherwise adopted.) 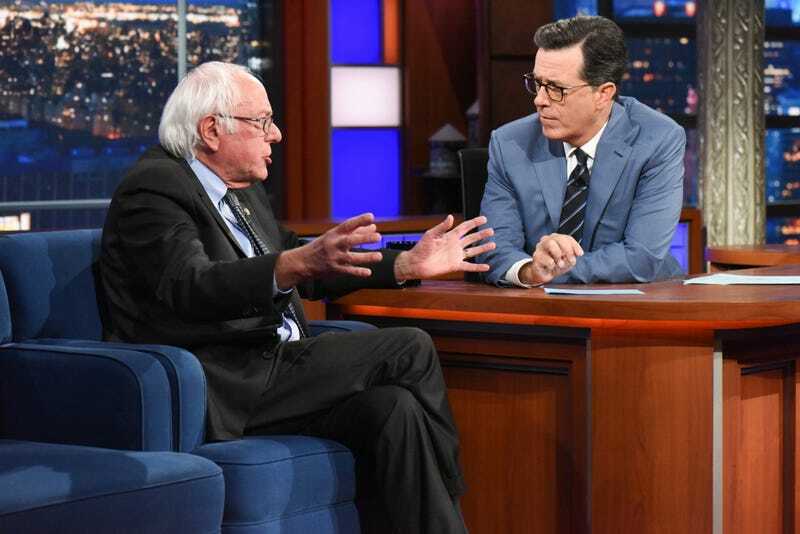 Still, Sanders (there to plug his own new book, Bernie Sanders Guide To Political Revolution) was his wonted “grumpy but twinkly old uncle” self, parrying Colbert’s attempts to edge him into a rehash of the 2016 campaign. (Clinton will be in that very same chair on Tuesday, September 19th’s Late Show, so we’ll see how that works out.) If nothing else, Sanders’ recurring, hard-to-argue talking point was that, in a world where Donald Trump is in the White House, there are bigger issues facing Americans who aren’t horrible, squirmy bigots and/or larcenous plutocrats than squabbling over how he got there in the first place.